The Mobile-Tensaw River Delta is a natural wonder treasured by locals and visitors alike. Many are interested in ensuring the protection of its unique wilderness, biodiversity and waterways along with expanding upon its economic value. Yet, the topic of its conservation has divided the region over the years in many ways. 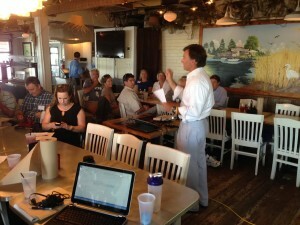 In an attempt to encourage consensus about the future care of the Delta, CAP, in partnership with the Delta Working Group and Dauphin Island Sea Lab (DISL), hosted the first Delta Round Table on Wednesday, June 25th. The round table was held at the Blue Gill on the causeway, right at the mouth of the Delta. A diverse group of 30 stakeholders attended the round table. The meeting provided a neutral space for attendees to express their enjoyment and concerns about the Delta and begin the conversation of finding common ground. Attendees indicated mutual enjoyment of the Delta’s wildlife, history, beauty and recreational activities while concerns included water quality, development along the Delta in northern counties and lack of ecotourism. In addition to the discussion, Dr. John Dindo with DISL presented briefly on the ecological importance of the Delta and potential future problems if no action is taken to conserve the Delta. Those in attendance recognized the benefit of continuing to meet and recommended potential topics to discuss. CAP is excited to assist in coordinating these upcoming meetings and facilitating the conversation about our Delta’s future.